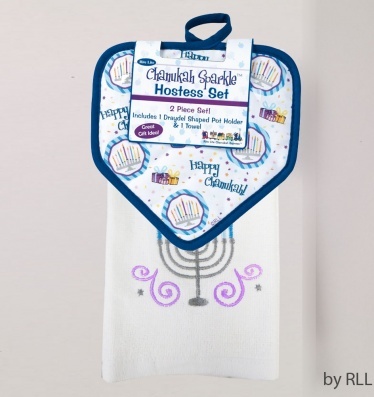 Your Chanukah Sparkle Hostess Set is a 2 Piece Set, Dreidel shapped Pot Holder, and matching towel all decorated for Chanukah with menorahs and presents. The perfect accessory for the Jewish kitchen. 100% Cotton. Hostess set is machine washable. Excellent gift for Chanukah and all year round.